Oh how I love eating cold somen noodles on super hot summer days! Especially today! Not only is it HOT, but it's humid too! I don't know about you, but there are days where it's so hot I just don't feel like eating anything temperature hot or greasy. So I always go to one of my old favorites. You don't need a whole lot and I just used what I had in my fridge. Hot house cucumbers, krab meat and scallions. Oh! 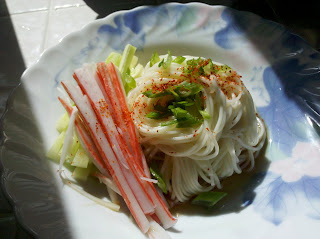 And the somen soup base...which I am showing you below. You can make your own stock, but this makes it so much easier sometimes. All you have to do is cook off the noodles, rinse them in cold water and put ice cubes with them to chill them. Julienne your cucumbers and krab meat. Small dice or cut on a bias, the scallions. 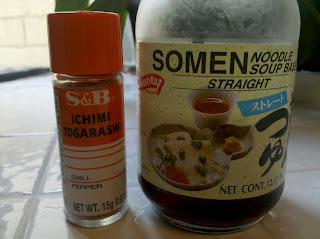 You can either dip your noodles in a bowl of the soup base or just pour some in and mix it up...and of course, I add lots of ichimi togarashi (chili pepper) for lots of spice! So i like to just play with different ingredients and combine things and I had a wee bit of kewpie mayo that I sprinkled with ichimi togarashi and I added it to my noodles and the soup base. It was so good! But obviously, for a healthier take on this dish and for those who don't like mayo(which I seriously cannot comprehend how anyone could not love mayo, but that's besides the point)...keep it basic. And this is just the perfect summer meal! So while I was waiting for my noodles to cook, I had all this krab meat cut up and I was starving!!! 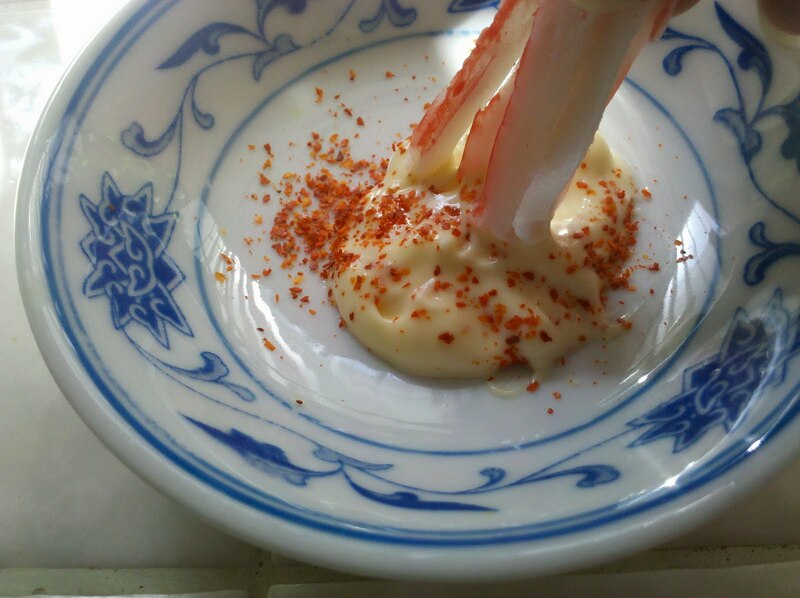 I couldn't wait anymore and needed to snack on something, so that's when I pulled out the kewpie mayo and sprinkled it with the ichimi togarashi and just dipped the crab. YUM! If I had some lemon, I would've put a little squeeze of it in there. After all is said and done...I always make extra because it is so good and refreshing! Plus, HELLO!! I don't want to have to make it twice! I packed the other half and I'll save it for later or for the next day! This is great for those of you who have to go into work and don't have a lot of time to go pick up lunch, or you are trying to save some money or just avoid eating out. Just put the top on and you can take it to work tomorrow! I already finished eating it and the bowl is sitting right next to me and it smells sooooooo good!! 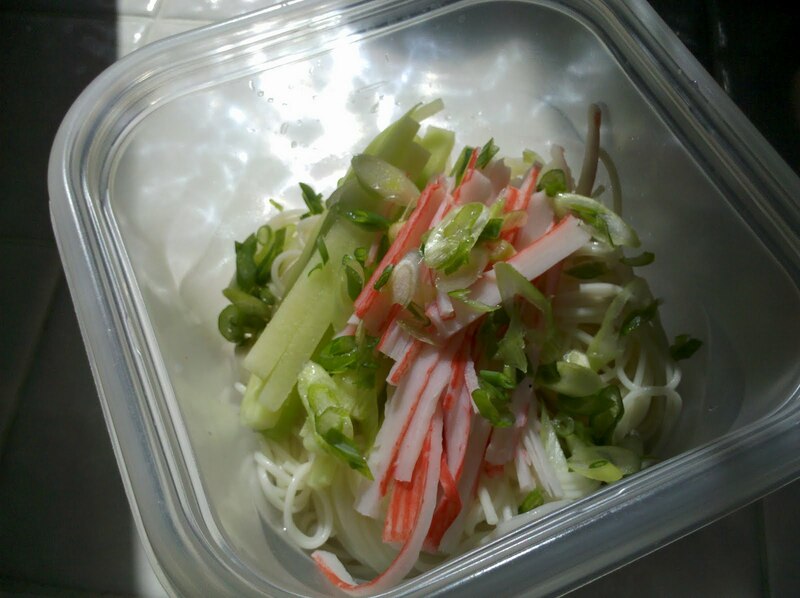 It is really fragrant smelling, especially from the combination of the green onions and cucumbers and soup base. I wish you could smell it right now. I swear, that little bit of kewpie mayo in there just added the perfect touch of creaminess to this dish. I love it!! I didn't put any measurements because this is about making as little or as much as you want!! Remember, you can add anything you want to this. I wish I had some tobiko...that little bit of salty, crunchy, pop would've been awesome! i love hard boiled eggs with my somen. at home we use shichimi togarashi--more flavors! :) what a perfect meal for a hot summer day! @ James - Ohhhh that sounds so delicious!! How do you make your sweetened fried egg? I will have to try that next time. Speaking of wasabi, I just tried fresh wasabi straight from japan tonight! It was really good. I liked it a lot! If I had that versus the other kind, it'll be awesome. Thank you sharing that info with me.